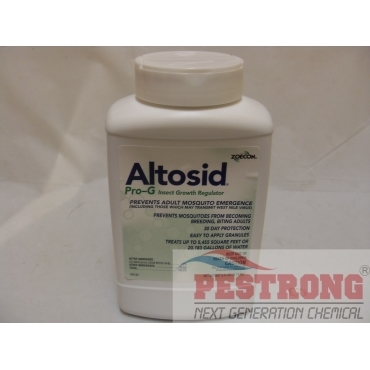 Where to Buy Altosid Pro G, Altosid Pro-G IGR for Mosquito - 2.5 Lbs - $29.95 for Sale with Fast Free Shipping! Altosid Pro-G IGR for Mosquito - 2.5 Lbs can kills mosquito larvae before they can develop into troublesome adults, minimizing the spread of breeding, biting and disease spreading mosquitoes. A granular larvicide applied to mosquito breeding sites including fish habitats, birdbaths troughs, flower pots, urns, sewers and other water-holding receptacles. Contains (S)-Methoprene --- 1.5%, a proven Insect Growth Regulator (IGR). No adverse effect on humans, pets, animals, fish or vegetation. Any area with standing water is a potential mosquito breeding ground. Mosquitoes aren't just a nuisance anymore; they're a serious health risk. With just one bite, they can transmit the deadly West Nile virus and other diseases that can cause encephalitis. Altosid Pro-G kills mosquito larvae before they can develop into troublesome adults. One application provides control for up to 30 days, without adversely affecting people or pets, and gives your customers another line of defense against these pests. 2.5 Lbs Bottle treats up to 5,455 sq.ft. or 20,183 gallons of water. The same Altosid Pro-G granular formulation is offered in a 40 lbs bag called Altosid XR-G.
A must for mosquito control! A little goes a long way and will keep mosquitoes from becoming biting adults for 30 days with each application to standing water. This is our choice product as its labeled for animal drinking troughs! Much cheaper and a more flexible label than mosquito dunks & is intended for pro use.